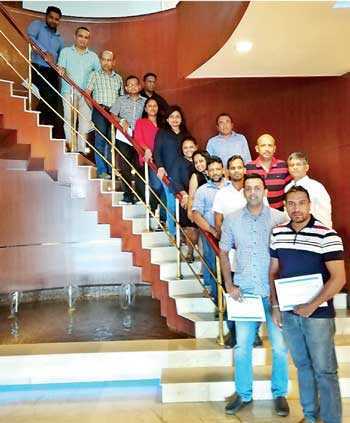 Deepal Sooriyaarachchi, the consulting partner of Results Based Leadership Organization USA recently concluded the fourth intake for the Leadership Code Based Leadership Academy held over four days at Cinnamon Grand. All the participants who took part in this program had to undertake a business project that adds more value to the organisation than the investment made on them. What participants appreciated and benefited most was Deepal’s ability to draw from his personal experiences and insights and local relevance. Even the international experiences used to enrich the interactions with the participants were very much relevant to local situations. Because the program was restricted to a small number there were enough opportunities for the participants to engage with the facilitator and get even personal advice to their challenges.Leadership Code is a concept developed by Prof. Dave Ulrich, one of the most respected leadership experts in the world. This unique program is built on the Leadership Code which is a research based synthesis of the critical knowledge, skills and attributes that are essentials for effective leadership. The leadership code draws on interviews with renowned leadership theorists, researchers, and consultants who together have written over 60 books and thousands of articles, and administered over two million leadership 360 assessments. The research conclusion is that all effective leaders share competencies reflected in five simple rules, while each person’s leadership will look and feel somewhat different based on personality as well as external circumstances, to be successful, every effective leader must master these five fundamental rules – or what is called the Leadership Code. The five rules are that a leader must be a ‘Strategist’ who shapes the future, be an ‘Executor’ by making things happen, be a ‘Talent manager’ by engaging today’s talent, be a ‘Human Capital Developer’ and have ‘Personal Proficiency’ through investing in him/herself. Deepal has conducted the Leadership Code programs in several overseas locations and more than 200 senior leaders have gone through these programs. As a part of this he also provides one to one coaching and mentoring to the participants subsequent to a 360 degree feedback survey based on the Leadership Code attributes. Registration for the fifth intake for the Leadership Academy is now on and it will be held on 28 and 29 September and 19 and 20 October at the Cinnamon Grand. Those interested can register with Inspire One on inspireone@sltnet.lk or phone 0777186266.